Just out of Chennai, roughly 55 km away, is the world-famous town of Mahabalipuram. The Pallava dynasty of Southern India, one of the major lines of kings to rule in India after the Gupta period, made this lovely seaside village their second capital. The place blossomed under the creative forces of that time between the fifth and eighth centuries. Today, the shore temple, the largest bas-relief in the world called Arjuna's Penance and the famous and beautiful mandapams has made this town world famous. Almost 5km north of Mamallapuram in the village of Salavankuppam, the tiger cave is a rock cut shrine dating from 7th century. Dedicated to Durga, it has a small mandapam featuring a crown of carved yali heads. Another 14 km from here lies Tirukkalikundram a pilgrim centre with a hilltop temple dedicated to Lord Shiva. Spread over an area of 1,265 acres, the Anna Zoological Park at Vandalur is the largest in South Asia with a rich variety of different species of mammals, reptiles and birds. The animals roam in natural surroundings with a special enclosure for nocturnal creatures. The coast road from Chennai to Mamallapuram is dotted with beach resorts, recreational areas and artist's communities. Site of an Old Dutch settlement dating back to 1609, today, Pulicat is a picnic spot famed for its lake. There are amenities for swimming, fishing, and windsurfing. History-buffs can wander around the ancient Dutch cemetery with its well-preserved tombstones. This beach resort is popular not just with the people of the city, but also with tourists. There is an entertainment arcade for children and for adults. There are folk dance performances apart from an Art Center that sells handicrafts and articles made out of seashells. The beach is clean and ideal for sunbathing. This is a cleverly planned beach resort geared to entertain the visitor with sculptured vignettes from the past, folk dances and ethnic seafood cuisine. 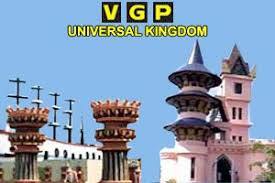 The V.G.P. Art Center, a part of the resort complex, sells merchandise ranging, from seashells to rural handicrafts. A Rock-Hewn Cave on Little Mount is believed to be the place where, in AD 72, the mortally wounded St.Thomas sought refuge. Near the modern Church of Our Lady of Good Health is the older Blessed Sacrament Chapel built by the Portuguese over the Cave. Inside the cave is the opening through which the fleeing saint is said to have retreated, leaving behind a still visible imprint of his hand near the entrance. At the rear end of the caves is the Masonry cross before which St Thomas is said to have prayed. The most important relic here is the ancient stone cross embedded into the wall of the alter which is said to have been engraved by the saint himself. This is the legendry "bleeding cross" that miraculously bled between 1558 and 1704. Below the eastern flank of the Mount is the Cantonment area, with its shady streets lined with 18th century neo-classical bungalows. Guindy National Park is an ideal picnic spot for a day spending with your family. This National Park encompasses a snake park and a children's park as well. Guindy Park boasts of over 24 varieties of trees, for example, Amona Squamosa, Atlanta Monoplylla, Feronia Limonia, Azadirachta India, etc. to mention a few. The main faunal attraction of this park is the occurrence of rare Indian Antelope popularly known as the "Black Buck", found nowhere in the world except India. Located at Peter's Road, Triplicane, it is one of the oldest temples in Chennai, built by Pallavas in the 8th century and rebuilt by the Vijayanagar Kings in 11th century. The temple is dedicated to Krishna, one of the incarnations of Vishnu. 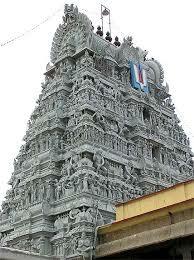 It has a coloured gopuram and several shrines with beautiful carvings. This is the highest and biggest park tower in chennai, located at Anna Nagar Park. It has cyclic stairs. Full view of the city can be seen from Top of the Tower. Built in memory of B.M. Birla, the well known industrialist and visionary, the Planetarium is considered to be the most modern in the country. This modern planetarium is housed in a hemispherical theatre. 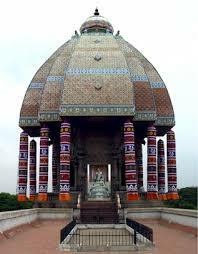 It is located at Kottur near Anna University. Valluvar Kottam, yet another architectural marvel was built recently in memory of poet-saint Thiruvalluvar, who is believed to have lived 2000 years ago. The saint authored a didactic book of epic proportions called Thirukkural consisting of 1330 couplets under 133 headings. The memorial is shaped like a temple car with an auditorium to accommodate upto 4000 spectators. The temple car structure is carved in granite with intricate details using the Dravidian Architectural style. Each chapter of Thirukkural is chiselled in a bas-relief. The auditorium is said to be the largest of its kind in Asia. Another pride of Chennai city, this building was named after Governor Lord Rippon, the father of Self-Government in India. 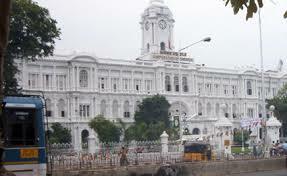 The Chennai Corporation and its council are functioning in this building. Now the Mayor of Chennai Corporation is elected directly by the people. Opp. to Park Rly. station. Chennai - 600 003. It is at Sardar Vallabbai Patel Road. 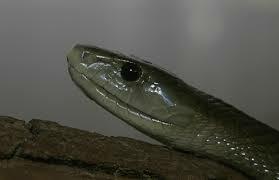 There are more than 40 species of common snakes of India here. The crocodiles, chameleons, monitor lizards and tortoises can also be seen in their natural setting. It was founded by Madame H.P. Blavatsky and Col. H.S. Olcott of U.S.A. to study religion & philosophy. In 1892 the society moved to Chennai and was set amidst a vast expanse of woods on the estuary of Adyar. Above all, the largest Banyan tree several a hundred years old is found on this campus. It spreads its branches and roots covering a space over 40,000 sq.ft. giving a serene ambience. Adyar, Chennai - 600 020. The first theme amusement park is Kishkintha near Chennai. Situated 28 Km South of Chennai near Tambaram spread over 110 acres, Kishkintha park offers exciting rides and attractions.